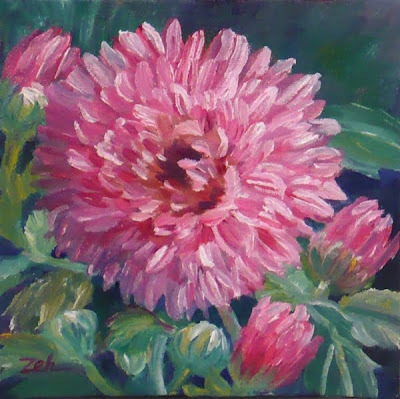 A lush painting full of movement, this Chrysanthemum is a beauty! It blooms in a neighbor's garden. By neighbor, I mean anyone who lives within a couple of miles of me. Out these parts, "just around the corner" could be over a mile away. At any rate, these neighbors have many lovely flowers and I enjoy taking a stroll over to their place for some of my paintings. This painting has been sold. See more of my artwork on my website: zehoriginalart.com. Thanks for stopping by today!